I was looking for a leaf to put with the Amigurumi Acorn pattern I was making... and couldn't find one that I liked. So I ended up trying a few techniques, and finally came up with this pattern. The thing I like best about it is the little curl that runs down the length of it, instead of being just flat. 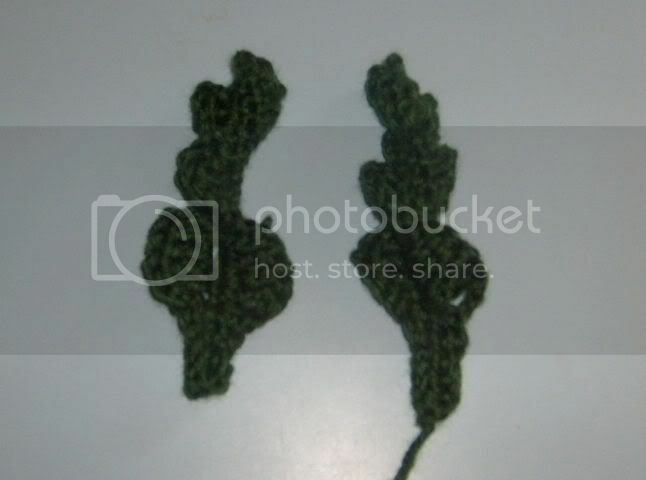 Yarn: Any yarn, I used a green worsted weight in a brand that is no longer made, I think. Piece will curl as you work, try to hold it flat to make sure you can see what you are doing. Row 3: repeat row 1. FO, weave in ends or use to tie to another piece.